There has appeared in recent times misguided ignoramuses and deviants who have grabbed a few sentences of the Shaikh, the ‘Allāmah Ibn ‘Uthaimeen (rahimahullāh) and claimed that the Shaikh warned against the Salafis and described them as a hizb (a partisan group). Some of our youth have asked us: “How is this possible when he is from the scholars of Salafiyyah and is well-known for refuting ahlul-bid’ah? How is it possible that a scholar of Salafiyyah, such as Al-Imām Ibn ‘Uthaymeen, would warn against Salafis whilst he is from their Imāms and a Salafi himself?” So, I will respond here to those who have taken advantage of the speech of Shaikh Ibn ‘Uthaymeen, and they shamelessly misapply his words to refer to other Salafi scholars and their students, and especially against the Allāmah, Rabee’ Ibn Hādi Al-Madkhali (hafidhahullāh) and his students. Firstly, I say it is impossible that Shaikh Ibn ‘Uthaymeen would criticise Salafiyyah because he himself was upon Salafiyyah and his teachers were upon Salafiyyah and taught the books of the scholars of Salafiyyah. Ibn Uthaymeen (rahimahullāh) was asked: “What is the intent of the term Salaf?” He responded: “The Salaf: Its meaning is those who preceded. Whoever precedes another, then he is a Salaf to him. However, when the term ‘Salaf’ is applied unrestrictedly, then it refers to the three virtuous generations: The Sahābah, the Tābi’een, and those who followed them. They are the Salaf As-Sālih (the Righteous Predecessors). And whoever comes after them and follows their Methodology (Manhaj), then he is like them, upon the Path of the Salaf, even if he comes later after them in time. That is because the term Salafiyyah refers to the Methodology (Minhāj) that the Salaf As-Sālih traversed upon, may Allah be pleased with them just as the Prophet (salallāhu ‘alaihi wasallam) said: ‘Indeed my Ummah will divide into 73 sects, all of them will be in the Fire except for one and that is the Jamā’ah.’ And in a narration, he stated about the Saved Sect: ‘Whoever is upon that which I and my Companions are upon.’ Built upon this, therefore, is the fact that the term Salafiyyah has a restricted meaning. So, Shaikh Ibn ‘Uthaymeen was an Imām, a Salafi, who affirmed the Salafi ‘Aqeedah and defended it – none would doubt that except one who Allah has left blinded. “As for taking Salafiyyah as a specific methodology such that a person singles himself out with it; and then declares the one who opposes him from the Muslims to be astray even if that Muslim is upon the truth; and [also] taking Salafiyyah like a partisan methodology, then no doubt, this is in opposition to [true] Salafiyyah. The Salaf, all of them, called to agreement and uniting around the Sunnah of the Messenger (salallāhu ‘alaihi wasallam); and they would not declare as astray those who opposed them due to an interpretation; unless it was in matters of ‘Aqeedah. They would regard the one who opposed them in ‘Aqeedah to be astray. Who was Ibn ‘Uthaymeen referring to here? Was it Shaikh Rabee’ or his students and their refutations? Read till the end of this article, and judge for yourself. 1. Shaikh Ibn ‘Uthaymeen stated about those who falsely ascribe their conduct to Salafiyyah: “And then he declares the one who opposes him from the Muslims to be astray even if that Muslim is upon the truth.” The truthful Salafi scholars and the students of knowledge are free from this behaviour. And we do not know from our Scholars anyone who declares a man to be misguided if the truth is with him. And if this was to take place wherein one of the shaikhs or a student of knowledge was to fall into an error, then the other Shaikhs and students would oppose him in his mistake and rebuke him, and call for him to rectify. So, this would be pointed out as an error and not accepted by the rest of the Scholars or students of knowledge – and this is well-known from the conduct of Ahlus-Sunnah, Ahlul-Hadeeth past and present. It is possible that a particular individual can be erroneous in his judgement upon another; but as for Ahlus-Sunnah, the Salafiyyoon gathering together upon a mistake and accusing someone falsely to be misguided, then this is not possible. We say to those who accuse the Salafiyyoon to bring an example of a man the Salafiyyoon have oppressed and declared misguided whilst the truth was with him? So, this in itself proves the falsehood of their claim and the false application of the statement of Ibn ‘Uthaymeen. And this is what Ibn ‘Uthaymeen and the rest of the Salafi Scholars are upon. The scholars make allowances for differences in interpretation that were known among the Sahābah and those who followed them; but no allowance is made for oppositions to the Usool (foundations) of the Religion, in the ‘Aqeedah and Manhaj. And this is in those matters wherein the Salaf of this Ummah did not allow differing. Furthermore, it is possible for a scholar of the Sunnah to err even in matters of ‘Aqeedah without intending that, due to a misconception, misunderstanding and a genuine misinterpretation based upon ijtihād because the truth did not reach him, and the mistake was not clarified for him, and then he passed away while his adherence to the Book and Sunnah and the Madhhab of the Salaf was known. Such a scholar is excused for his error. So, it is said that he erred but is not an innovator. See below the speech of Ibn ‘Uthaymeen concerning Ibn Hajr and An-Nawawi (rahimahumallāh), both of whom erred in the ‘Aqeedah. 3. Shaikh Ibn ‘Uthaymeen certainly did not intend the likes of Shaikh Rabee’, Shaikh Muhammad Amān Al-Jāmi (rahimahullah) and others from the scholars as the Hizbies and Mumayyi’ah assert. “We praise Allah, the One free of all imperfections and Most High, that He has made it easy for our brother, Doctor Rabee’ Ibn Hādi Al-Madkhali to visit this region so that the one to whom some of the affairs were obscure comes to know that our brother, may Allah grant us and him guidance and success, is upon Salafiyyah, the path of the Salaf. I do not mean by Salafiyyah that it is a party established to oppose other than it from among the Muslims. Rather, I intend by Salafiyyah that he (Shaikh Rabee’) is upon the Path of the Salaf in his Manhaj, and especially in actualising Tawheed and opposing whatever contradicts it. This, therefore, is the difference between Ahlus-Sunnah, the Salafis who truly follow the way of the Salaf and the false claimants. Shaikh Rabee’ was the first of all the scholars to refute the Haddādiyah, and he has not ceased to warn against them till this day. “Those who ascribe themselves to the da’wah today, then among them are those who lead others astray. They desire to deviate the youth, and to turn the people away from the true Religion, and to divide the jamā’ah of the Muslims and to lead them into fitnah. So, the issue is not about ascriptions or what they make apparent. Rather, consideration is given to the true realities, and the end result. Individuals who ascribe themselves to the da’wah (of the Salaf), then it is obligatory to look into their credentials. Where did they study? From whom did they take knowledge? Where were they raised? What is their ‘Aqeedah? Look at their deeds, and their effect upon the people and what they produce of good. And what comes about from their actions in terms of rectification? The Shaikh answered: “The labelling of oneself with Salafiyyah, if it is true, is not a problem. 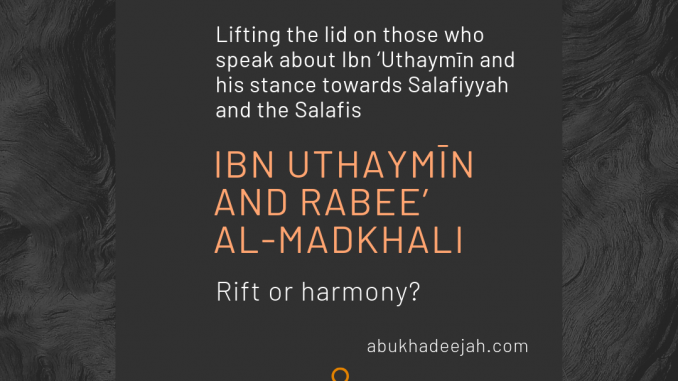 But if it is merely a claim, then it is not permissible for a person to label himself with Salafiyyah when he is upon other than the Manhaj of the Salaf. The Ash’aris, for example, say ‘we are Ahlus-Sunnah wal-Jamā’ah.’ And this is not true because what they are upon is not the Manhaj of Ahlus-Sunnah wal-Jamā’ah, and likewise is the case with the Mu’tazilah who label themselves as Muwahhideen (people of Tawheed). So, the one who claims that he is upon the Madhhab of Ahlus-Sunnah wal-Jamā’ah, then he follows the Path of Ahlus-Sunnah wal-Jamā’ah, and he abandons the opposers (mukhālifeen). As for the person who wishes to unite the lizard and the fish, as they say – meaning, that he seeks to unite the animals of the land with animals of the sea, altogether, then this is not possible; or that he wants to gather fire and water in the same pan. Fatawa Noor ‘Alad-Darb 4/2 upon the numbering of Shamela. See Ath-Thanā al-Badee’ of Shaikh Khalid Adh-Dhufeeri. Source: Kashf Al-Lithām ‘an Mukhālafāt Ahmad Salām. Source: Sharhul-Arba’een An-Nawawiyyah, explanation of hadeeth 28; see also Kutub wa Rasā’il of ‘Uthaymeen 34/15, with the numbering of Shamela. Al-Ajwibah Al-Mufeedah ‘an As’ilah Al-Manāhij Al-Jadeedah, p. 35-39.